I am participating in the 31 Days of Free Writes October challenge. This is meant to be a free write, which means: no editing, no over-thinking, no worrying about perfect grammar or punctuation. What are we going to do about all the books? This is a question Wayne and I have asked each other multiple times over the last week or two as we prepare to get the house ready to be listed. Although we have ideas (donate to Friends of the Library, etc. ), the question sill begs itself. My non-productive, related answer/thought is: we should have refined our approach to book acquisition long, long ago. As we were in my son’s old room/our former “extra” room yesterday, going through books (many of which we had stored in a closet), I grew more and more disenchanted with the deluge/accumulation of books. So many books — books we had truly enjoyed, books we had felt compelled to buy but never cracked the cover of, books we had felt obligated to buy (I may have gone to quite a *few* book fairs back in the day and had many friends selling educational books), books we hoped would expand our children’s worlds. The collection of books certainly tells the Kiger story in a way, though. Parenting books (did those work? ), cookbooks, political books and, memorably, the wonderful Eugenia Price books. This whole house/move process is leading me to wish I could retroactively refine my approach to acquiring things (not just books) and accumulate so many less material items. Help #ProjectReadathon Generate Children’s Books! I have been a Charity Miles ambassador for many years now, and it is astounding to see how the app and its impact on deserving causes have both evolved (big props to creator Gene Gurkoff for that). I am excited that Charity Miles is partnering with Penguin Random House to conduct a campaign around children’s books. As a proponent of Charity Miles, one of my goals over the years has been to encourage people to use the app, to dispel misunderstandings, and in general to talk it up in order to help as many causes as possible. For example, you don’t have to be a “serious athlete” doing “serious mileage” to make a difference. Walking from your parking spot into the grocery store, for example, can help. Anything over a tenth of a mile counts toward benefiting a favorite charity. I know, I know — everything I have said so far involves physical exertion. Now, however, Charity Miles has added READING to the ways you can help a cause. READING, people! And you know how I feel about that! Though April 23, Charity Miles is partnering with Penguin Random House for the #ProjectReadathon campaign. During the campaign, Charity Miles members will be invited to contribute minutes to the Million Minutes goal by visiting the Charity Miles Impact Hub! Side note: Even as a veteran Charity Miles user, it took me a little searching to find the Impact Hub. Here’s a screen shot of what it looks like (assuming you have installed the Charity Miles app). Just follow the red arrow. Today, for example, I read “Hardwiring Happiness” which generated a 3-book donation. Reading inside the Impact Hub triggers book donations from Penguin Random House to kids in need in the US, Canada, and Mexico through Save the Children. The more you read, the bigger impact you have: read a 20-minute excerpt and you could unlock a 5-book donation, or read an hour and unlock 20. The excerpts expire in 24 hours so keep up your reading streak and read every day. But Moving Is Always Good Too! You can also unlock books by walking, running, or cycling and logging Charity Miles. Charity Miles has set a goal to log 10,000 Charity Miles for Save the Children. Each mile will translate to one minute read, for every 20 mins a book will be donated. Reaching the goals means moving 2,500 books to children in North America! So many of us have books peeking out of multiple little corners of our homes. Stacks of books our children discarded long ago. Books we grabbed on impulse at the bookstore and haven’t gotten to. Books we read, loved, and just can’t part with. A productive, contributing nation is dependent on a literate society. Every child deserves an opportunity to own books, learn how to read, and obtain the fundamental building blocks to achieve their highest potential. I applaud Penguin Random House for helping kids become readers and, therefore, lifelong learners via #ProjectReadathon. Since starting yesterday, I have read two excerpts, resulting in donations of six books, and walked 0.28 miles. That part was a pretty tiny start, but hey, that means there are only 9,999.72 more to go? I would love your help in getting there. More importantly, so would kids in need of children’s books. Dr. John Izzo’s new book, The Five Thieves of Happiness, defines insidious mental patterns that steal happiness. The five thieves are control, conceit, consumption, coveting, and comfort. I appreciate Dr. Izzo sharing this excerpt from his book, concentrating on the thief of control. The thief of control makes us like the monkeys of Southeast Asia who were captured at one time by locals through a simple yet cruel trick. Sweets were placed all around a tree, and a coconut was hollowed out, leaving a hole just large enough for a monkey to slip his hand through. Inside was placed a sweet. The other side of the coconut had a bolt that was chained to a tree. When the monkeys came and ate the sweets spread around the tree, one monkey would inevitably pick up the coconut, reach inside, and grab the treat. But the hole was not big enough to get the clenched fist out. The monkey would often try desperately to carry off the coconut, but, try as he might, the coconut could never be taken nor the sweet removed from its shell. The only thing the monkey had to do to be free was unclench his fist and let go of the sweet. Yet most monkeys fought until utterly exhausted. The islanders would simply capture the monkey in that exhausted state. The monkey’s undoing was his own attachment and inability to let go. Happiness is knowing what we can control and accepting what we cannot control. At the most basic level, happiness comes from understanding that we can control our actions and our responses to things external to us, but we cannot control the results of our actions. Focusing on our actions brings happiness; focusing on the result of our actions brings unhappiness. The Buddha and Jesus often appear to the casual reader to be very different in their approaches to enlightenment or salvation (the two terms used in each tradition). In fact, the more one examines the teachings of each, the more one sees the way that both teachers emphasize the need to surrender to that which is at any moment. This is why the Buddhist Thích Nhâ’t Hanh has written extensively about the similarities of each teacher. When Jesus encouraged his followers to look to the flowers of the field as role models because they did not seek, he was making a very important spiritual point. When he said, “Who of you by worrying can add a single hour to your life?”¹ he was making the same point. It is not the lack of control that brings suffering but the desire for control, which keeps us from lasting happiness and peace. One of the big moments in my own life was when I first understood the distinction between attention and attachment. Attention is the energy and choices I make, whereas attachment is an inner desire to control what is inherently uncontrollable. Another way to think about this is to see it as intention without tension. Having goals in life, or even desires of what we want to happen in any particular situation, is not a problem in terms of our happiness. It is when we become attached to controlling an outcome that the thief starts to rob us. The theft of our happiness rarely comes from our intentions but from the tension we feel when attached to the outcomes of things. How do we know the difference between attention and attachment? Attention is about taking action in the present moment toward hoped-for ends, whereas attachment is becoming wed to a particular outcome’s being the source of our happiness. I play a great deal of tennis, and this point can be illustrated easily there. Happiness on the tennis court is found in the experience of the body playing the game, the joy of experiencing the way the body, the racquet, and the ball all become one. In my most sublime moments playing tennis, my focus is simply on being fully present in the game, attentive to how I am hitting the ball and moving my feet. The moment I become focused primarily on whether I am going to win a point is the very moment when tennis becomes a source of unhappiness. Of course, I have the intention of winning a point and even the match, but this is an outcome I cannot control. What I can control is my intention to be as fully in the game as possible at every moment. Life is much like that tennis game. We are happiest when we are simply fully present in each moment, expressing our intention through our focus and unattached to the outcome as the source of happiness. Often we discover that the outcome—the goal we have become attached to—turns out to be less rewarding than the striving (the intention). My partner, Janice, tried out for the national baseball team in Canada for 18 years! For almost two decades, she worked hard, played hard, and practiced hard, and every year she tried to win a spot on the roster. Every year she failed to make it until finally, after all those years, she was given a spot. You would think, of course, that the outcome would have been the highlight of all that struggle. The opposite turned out to be the case. Getting on the team was anticlimactic compared with the present-moment focus, year after year, of trying to be the best player she could possibly be, both on the field and in the inner mental game. Besides, she could not control the outcome, so the more she focused on the process, the happier she was. Dr. John Izzo is a corporate advisor, a frequent speaker and the bestselling author of seven books including the international bestsellers Awakening Corporate Soul, Values Shift, The Five Secrets You Must Discover Before You Die, and Stepping Up. His latest book is The Five Thieves of Happiness. Connect with him via his website, on Twitter, and on LinkedIn. ¹Luke 12:25 (New International Version). Barnes and Noble $100 Gift Card #Giveaway! What are you reading right now? I’m reading The Wright Brothers, by David McCullough. I was inspired by our family trip last month to Greenfield Village near Detroit, where I saw the Wright Brothers’ home as well as their shop. After visiting those two buildings, I had to dig deeper! I always have a book in my hand as well as an audio book in my ears. I love books! It’s fun to dream about what I would do with $100 to spend at Barnes and Noble! With this giveaway, you just might get that opportunity. Rules: Use the Rafflecopter form to enter daily. Giveaway ends 9/5 and is open worldwide. Winner will be notified via email. 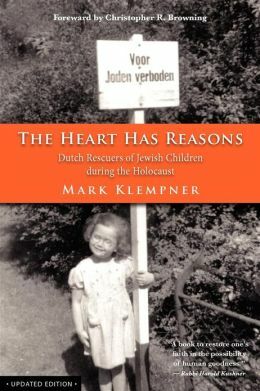 Quite a few years ago, I ran across this radio interview of Mark Klempner, about his book, The Heart Has Reasons: Dutch Rescuers of Jewish Children During the Holocaust. I began an email correspondence with the author, partially to ask if he could be a resource for my daughter who was writing an essay about the Holocaust. Throughout the ensuing years, we maintained a “social media relationship” but, for reasons that absolutely confound me now, I did not read the complete book. I am happy to report that is no longer the case. I have finally read the book, and I encourage you not to make the same mistake I did and let years elapse between hearing about it and reading it. As history demonstrates, the subtle beginnings bloomed into full-scale persecution, death, and cruelty. By protecting Jewish children, who were often literally handed to them by their fleeing parents, these ten people saved lives. I was struck, in so many of the book’s passages, by the rescuers’ insistence that they were not heroes. To be absolutely, perfectly, completely honest, one of the reasons I feel so strongly as a parent about Holocaust education is that I want to raise children who grow into adults who would “do something” in the face of persecution, cruelty, and evil of any kind. One concept that appeared several times in The Heart Has Reasons, however, was the fact that not everyone “does something” and that “not doing something” is not always a disservice. One rescuer pointed out that someone without the courage to take risks, who tried anyway, could end up endangering sophisticated rescue operations. Mark Klempner coalesced some of the rescuers’ opinions regarding the “view that the inaction of their bystander neighbors possessed some merit. If someone suspected that you were harboring Jews and yet did not inform the Nazis, that person was, in a way, helping the Resistance.” Other examples included a baker who gave extra bread to one of the rescuers to feed the people she was hiding, as well as policemen who warned rescuers of raids. One word stuck with me between the day I finished this book and tonight when I sat down to blog about it. It’s a word I would probably pronounce wrong, a word I was not familiar with until I read this book, but now will not leave me or my consciousness: chesed. The Heart Has Reasons makes it simple to keep sight of the line of “good” and “chesed” passing through ten human hearts. It’s a line I hope to carry forward in the way I live and parent. ADDENDUM 3/24/13: In correspondence with the author about this post, he pointed out that the way people who did less than they could have was seen by the rescuers through the rescuers’ particularly non-judgmental filters. He wrote me: “the rescuers’ generous positive regards towards people who did just a little bit says more about the rescuers than about the almost-bystanders. To me, it indicates how appreciative and grateful the rescuers are/were. As for those almost-bystanders, I would hope they have asked themselves, “Why didn’t I do more?” The rescuers let them off easy because the rescuers are very loving, non-judgmental people. But considering the enormous number of innocent people who were slaughtered, historians tend to judge them more harshly. But one of the great lessons meeting the rescuers reinforced in me is that loving not judging is really where it’s at.” The last thing I want to imply is that doing nothing in the face of atrocity is advisable. And I appreciate Mark Klempner’s additional clarification.